Tonight we had an International Potluck Dinner with some friends; our “entry” was this Tilapia dish. 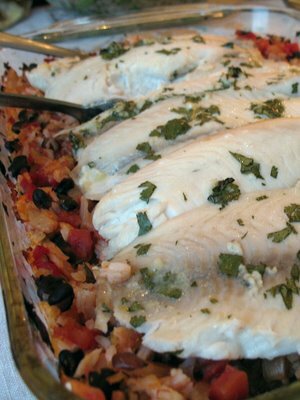 The fish is marinated in lime, garlic, cilantro, and a bit of oil, and baked over a dish of rice that’s been mixed with black beans, tomatoes, oranges, and various spices. This picture doesn’t really do it justice; it was delicious! The rice was really different, we loved the bits of orange in it. This entry was posted on Sunday, May 20th, 2007 at 11:54 pm	and is filed under Main Dishes. You can follow any responses to this entry through the RSS 2.0 feed. You can leave a response, or trackback from your own site.